Our holiday villas are perfect for families with children. Nerja's year round magnificent climate is the principal reason people visit the area. With 12 kilometres of beaches and the sea warmed by the Mediterranean climate, it is no wonder that Nerja is the number one choice for so many families with children. But the area has so much more than just sun and beaches. Inland there is another land waiting to be discovered. In Nerja Healthy living and outdoor pursuits await you and the kids and as well as waterparks and attractions for them there are many beautiful villages and marinas within a short drive. Nerja has a bustling night life with an abundance of fantastic bars and restaurants offering a whole array of international cuisine, live music and entertainment to suit everyone (yound and not so young! See below for further details of one of the local water parks and the Nerja Donkey sanctuary. Around 25 minutes drive from our Villas in Oasis Capistrano. Located in the Province of Malaga, Aqua Velis is one of southern Spain's most popular and thrilling water parks attracting thousands of visitors each year. The park is spread across a gorgeous coastal area on the Costa del Sol, conveniently situated on the outskirts of Torre del Mar and west of the fantastic town of Nerja. Regular buses run from Nerja to Velez Malaga or a car journey takes less than 20minutes. This fantastic water park is the largest and most exhilarating attraction in the province boasting over twenty dynamic water-based rides, such as super-fast and spiral slides, a dingy river ride and paddling pools for the younger children. Visitors to the park also discover a superb range of facilities that reflect the high quality of service offered throughout Aqua Velis, including a selection of restaurants, bars and cafes. 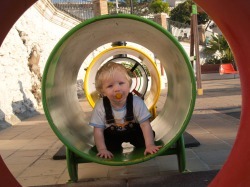 If you are looking for things to entertain the kids whilst in Nerja and looking for a day out Aqua Velis is a great day out for all the family. Aqua Velis is open from mid June to mid September the opening times for the water park vary between two schedules during the year, in June and September the gates open daily at 11am and close at 6pm. During the high summer months of July and August the park is open an hour longer in the evenings, with the gates opening daily, again at 11am and closing at 7pm. Visitors to Aqua Velis should be aware that the park is closed all day Monday, which is standard practice in the vast majority of businesses across southern Spain. The car park at Aqua Velis is also reasonably priced and offers ample space for visitors arriving by road. Group discounts are available and for any further information Aqua Velis can be contacted directly on 00 34 952 54 27 58, or 00 34 952 54 27 62. There is no need to pre-book. Payment is made at the entrance kiosk. A visit to the Nerja donkey sanctuary should be on the list of things to do and is a great place to keep the kids amused for anyone staying in the Nerja area. It is an ideal place to while away an hour or so and if you visit on a Saturday morning then children get the chance to help-out with the daily chores for the animals (supervised of course). The Nerja donkey sanctuary is run by a team of unpaid volunteers and during that time it has helped to provided shelter and a safe home for many donkeys, horses and mules as well as other abandoned animals such as dogs. The Nerja Donkey Sanctuary differs from other animal charities in that they operate a free range animal welfare policy which means you can mix, play and groom their residents - just the animals!, take dogs for walks, and also bring along apples, carrots, lettuce, pears, bread and even old stale rolls to feed them yourself. FROM TOWN - From SUPERSOL, over bridge and as the road turn RIGHT at the Bridge Bar, you then want the FIRST IMMEDIATE LEFT OPPOSITE THE BAR. WALKING: 5 MINUTES FROM THE CENTRE OF NERJA - From SUPERSOL, just keep on the left hand side of the pavement heading over the bridge and keep left and walk straight down the pavement, and we are the last plot at the end, just past the Nerja Arch and next door to the Builders merchant, NARAVEZ & NARAVEZ - On the opposite side of the main road is the Repsol yard.